In our special series re-visiting great Hindi film classics, we look back at Qurbani, starring Feroz Khan, Vinod Khanna and Zeenat Aman (1980). A shiny disco ball, abundant lens flare, a bunch of semi-clad juniors on guitars and drums while a ultra glamorous Zeenat Aman, dressed in a slinky red gown with loooong slits highlighting her loooong legs, sashays to Nazia Hassan’s delicate rendition of Aap jaisa koi. As a kid, I would wait with bated breath to catch this iconic song’s video on Doordarshan’s weekly compilation of melodies -- Chitrahaar/Chhayageet and relish the smoothness of this ambient, beloved ditty, secretly hoping to install a disco ball, in a room purely designed for dance, when I was old enough to buy my own house. That’s the magic of movies. They touch us in the most unusual, amusing ways and adorn our memories for as long as we live. Actor/filmmaker Feroz Khan’s 1980 blockbuster, Qurbani, made quite an impression with its novel and ambitious ideas to entertain. His body of work (at its prime) mirrors his larger-than-life persona and sophisticated ideas of showmanship underlined by self-style morality, unpretentious sensuality and swanking drama. One of the biggest successes of his career, Qurbani co-starring Vinod Khanna and Zeenat Aman oozes style, sizzle and just about enough substance to carve a niche of its own. First, he does time in prison for a burglary whose loot he let his friend (Kader Khan, also credited for dialogues) walk away with. And then he’s coerced into stealing from Amrish Puri’s humongous vault by the revengeful brother-sister duo (Aruna Irani, Shakti Kapoor) to prevent his girlfriend Sheela (Zeenat Aman), Amar and the latter’s little daughter (Natasha Chopra) from facing dire consequences. While Rajesh bids time behind bars, Sheela bumps into an erstwhile smuggler Amar and his motherless daughter, Tina and the two. Of course, one glimpse of Zeenat’s Aap jaisa koi redux, in a glittering, golden costume (designed by FK’s then wife, Sundari), gets Amar jelly-kneed and he doesn’t waste any time in serenading her with the lilting Kalyanji-Anandji composition, Hum tumhe chahte hain. Amar is rejected, Rajesh is released and a flattered, fabulous Sheela returns to rock the dance floor with yet another chartbuster, Laila (this time in Kanchan’s spicy delivery). Interestingly, the two hot-blooded heroes come face to face only after almost eighty minutes into the movie. 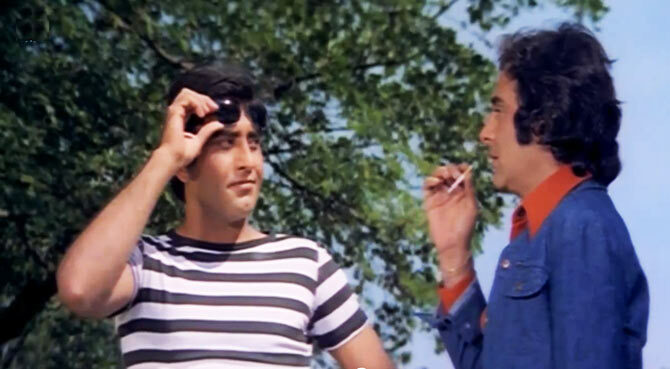 Feroz Khan and Vinod Khanna’s cigarette sharing’ chemistry is effortless and thrives even in the absence of a solid motivation to establish ground. One macho compliment is all it takes, “Maar bhi deta toh kya farak padta? Fauladi aadmi ho, goli takrake wapas chali jaati,” to kick-start the connection. Zeenat Aman’s brand of sexiness has elevated the hotness quotient of many lavish productions but the grace, the gloss and the glitz of Feroz Khan’s treatment is something else. Even though the 28-year-old appears in an itsy-bitsy bikini during a night scene at the beach, the manner is tasteful not exploitative. The camera (shot by Kamal Bose), as it usually happens, doesn't linger on the lady’s curves instead the fleetingly surveying expression on FK's face conveys the sensuality of her impact and his lust. And then when she wants to know why he didn't join her for a swim, come this killer line, "Jaaneman, agar hum bhi aa jaate toh samundar mein aag nahi lag gayi hoti." Can you think of a single actor today who can pull this off? I cannot. Incidentally, this afore-mentioned scene is the reason why Qurbani’s release was delayed by a few months since the censor disapproved of it. The film was eventually passed without any cuts but an A-certificate. If you ever wondered why the adjective debonair is attributed to Vinod Khanna in his nostalgia-themed profiles, watch him in Qurbani. The man with the trademark cleft chin looks like a dream; the camera loves him (even if Sheela doesn’t) whereas the climax ensures he walks away with all the sympathy votes. Khanna’s role doesn’t have much to contribute in terms of histrionics but he does well in flaunting his bravado (Maine jabse hosh sambhala hai, khilono ki jagah maut se khelta hoon) and bare chest to the best of his abilities. His friend, co-star, producer and director Feroz Khan does walk away with the bigger share in the booty. And yet, without 33-year-old VK’s understated intensity, FK’s flamboyance (40 then) would not flourish as it did. His camaraderie with another Khan – Amjad are some of the drollest moments in the film. Surprisingly unsung; Amjad Khan’s performance is one of the coolest cop portrayals in Bollywood history. His maverick police officer incessantly chews gum, grins like a fool out to fool, quotes Ghalib (Bekhudi besabab nahi, Ghalib, kuch to hai jis ki pardadari hai), straightens a tilted jeep with his bare hands (long before such actions became Sunny Deol’s copyright moves) and changes disguises from a Gullug-gullug-spewing drummer (in Laila) to a sword-wielding Pathan (in Qurbani Qurbani Qurbani) in FK’s pursuit. Among the other key players, Amrish Puri is, expectedly, the face of evil but not the main baddie. Even so the actor is most effective with his weighty baritone, frilly hairdo and a wardrobe that resembles John Travolta’s look in Saturday Night Fever. The shot with his corpse in the fish aquarium is most stunning and spine chilling. But that’s not his most talked-about scene, is it? No story on Qurbani is complete without the Mercedes mention. Akin to an item number, the moment appears right in the beginning, the one where FK decides to teach a haughty Puri a lesson in humility by mercilessly smashing his luxury vehicle against the walls and pillars of a basement parking. The mastermind behind all the villainy in Qurbani is mostly Aruna Irani (sporting a pair of creepy contact lenses) and her on-screen sibling Shakti Kapoor. You got it hand it to Irani; she treads the OTT route with wicked, WICKED relish. The only time Qurbani fumbles is when the needless comic interludes alternately featuring Tun Tun, Jagdeep and Dinesh Hingoo pop up. They serve no purpose except slowing down an otherwise snappy pace. Qurbani’s repeat value lies in its high-adrenalin action and seductive imagery against Kalyanji-Anandji’s snazzy background score (in the tradition of Johnny Mera Naam, Don), Feroz Khan spares no expense to make this a lavish affair. From destroying brand new cars to filming extensive car chases in London to reconstructing sets till they match his vision to approaching UK-based composer Biddu and rolling Pakistani pop sensation Nazia Hassan (barely 15 at that time) to breathe life into Aap jaisa koi or extracting hip tunes out of Kalyanji-Anandji (lyrics by Indeevar/Farook Qaiser), FK gives it his all. With this film, he also turned a full-fledged editor. Cool elements like cars and choppers blend around thrilling seconds of sneaking into vaults and safes, smuggling gold biscuits and jewels, hoodwinking surreptitious cops, followed by raw, real dishoom dishoom and strategically-constructed explosions topped by a racy, elaborate finale at a time when a film’s crew devised mechanical methods in place of CGI or VFX to create spectacle is most commendable. With Qurbani, FK hit the prime of his creativity. His following films tried but failed to match the ingenuity of Apradh, Dharmatma or this one. The late legend wished to remake the film with his son, Fardeen and Saif Ali Khan but never came around to. A reworking is reportedly in the works. Boy, what a tall order that will be.